When SDSU takes on St. John’s in the Round of 64 of the NCAA Tournament this Friday in Charlotte, N.C, it will be a homecoming of some sorts for senior forward Dwayne Polee. 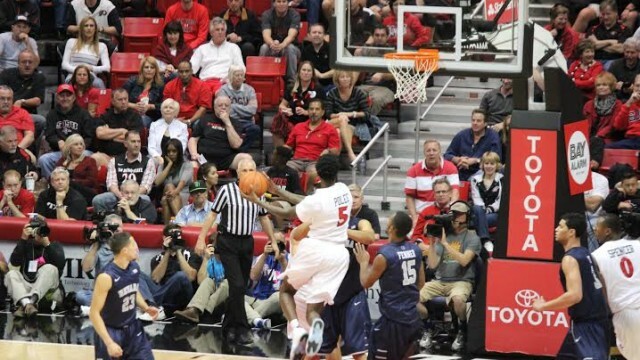 Polee played in 33 games with the Red Storm as a freshman before transferring to SDSU his sophomore year. He even played for them in the 2011 NCAA Tournament when they were defeated by Gonzaga in the Round of 64. Even though he’s playing a team he once had a close connection to, it’s just business as usual for Polee. Polee cited that the team had 10 seniors when he was a freshman and that they have a totally new “makeup” now. One person who’s still there, though, is St. John’s coach Steve Lavin, who recruited Polee. Given that Polee has not been a member of St. John’s in over three years, his scouting report may not be as accurate as it once was. However, one thing certainly working in the favor of the No. 8 seed Aztecs is that one of St. John’s premiere performers, junior forward Chris Obepka, will be suspended. Obepka was suspended for two weeks on March 16 by St. John’s for a violation of team rules. He is a key enforcer for the Red Storm, averaging a team-high 3.1 blocks per-game. Tip-off in Charlotte, N.C., on Friday is scheduled for 6:40 p.m. and the game can be seen on CBS, as well as heard on the Mighty 1090 AM.